Temperature can affect the physiology and distribution of estuarine animals, algae and plants. 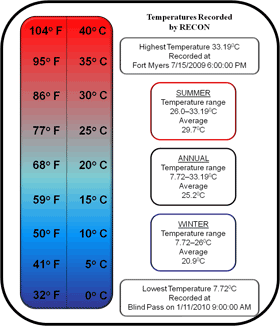 Temperature is reported in scientifically accepted units of degrees Centigrade (°C). To provide some context, water freezes at 0°C and boils at 100°C. Most marine and estuarine animals have evolved to tolerate a wide temperature range, though some species, like snook, are at the northern limit of their range in South Florida. Changes in temperature can be cues for some animals to spawn or migrate. Slow moving and sessile organisms may become suceptible to disease or predation when temperatures change beyond their tolerance level. Seagrass growth rates increase with temperature, and flowering is temperature dependent. The dinoflagellate responsible for Red Tide has a temperature tolerance range of 15 to 30°C. Temperature can also change the the solubility of gases and water soluble compounds. For example, warmer water has lower concentrations of dissolved oxygen. If atmospheric greenhouse gas concentrations continue to increase, temperature increases of 1 to 2°C combined with wider swings in temperature are expected in Florida during the next 50 years which are expected to cause shifts in species distributions.